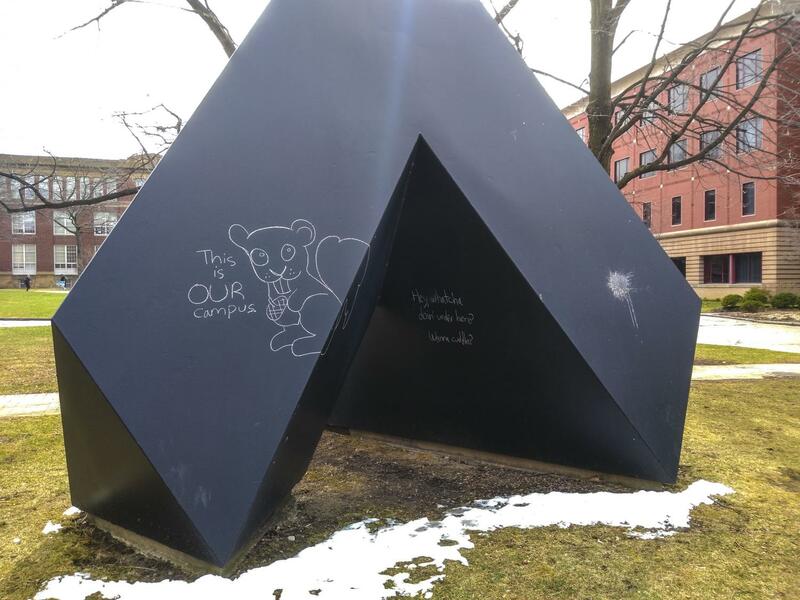 Spitball by Tony Smith is a staple of the Case Quad, but it has also ignited a debate over the difference between vandalism and community ownership. Years ago, there was a beacon of spontaneity smack in the center of the Case Quad: Spitball. The iconic metal monolith in the center of the Case Quad creates some strange gravity around which our studies orbit. While I admire it for the art itself, I also marvelled at what the campus added. Spitball was a message board to the world, with clubs chalking notices onto its many faces and aspiring artists using its sides as canvases. I joined the ranks of chalkers, and I fondly remember late night excursions with friends to turn a face of Spitball into chalk art. Art, especially chalk art, is temporary, though. One day, the chalk stopped. The rain washed the steel clean, and it so remained. 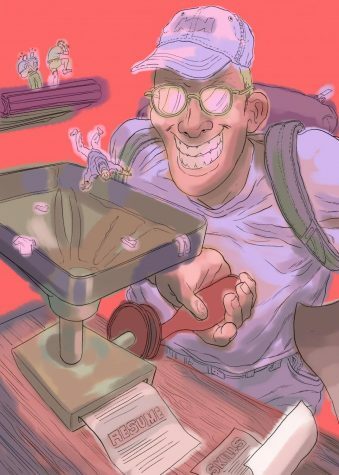 At this time, a whisper ran through the student body. The administration did not want groups to draw on Spitball. It was defacing a valuable piece of art by a famous artist. It was damaging the sculpture itself. The official party line remains to this day: no chalking. The student body has kept its distance from Spitball; chalk rarely graces its faces. I was astounded at the speed at which the chalking ceased. Spitball became bare after the next rainstorm, and remained so. I went back and chalked some small new art, which lingered alone on the sculpture until another shower washed it off. I tried again, but no one joined me. Spitball shows chalk art only rarely now. The rain washes the steel clean. We, the student body, should resume chalking on Spitball. The university should allow this expression of art. The simplest argument against chalking Spitball is that the chalk damages the sculpture. This is misleading. A casual glance at Spitball shows clearly that while some surfaces suffer continuous damage, they are not the surfaces on which chalk is regularly applied. It is the horizontal faces at the peak of the statue and the “leg” at the back that are degrading, but those faces are never chalked. The sides of Spitball, where the chalking happens, are pristine by comparison. This disjoint between chalking faces and damaged faces highlights how chalk art is not a significant contributor to ongoing damage. Instead, rain collects on the horizontal faces of Spitball, rusting away the metal. This could be easily remedied by the university. The damage to Spitball is therefore not from student chalk art, but rather is born of neglect by the same administration that now feebly argues for untouched preservation. The most powerful objection to chalking Spitball is that chalking such a valuable piece of art is vandalism, disrespectful to the artist. No one would be so bold to chalk on the Mona Lisa or the roof of the Sistine Chapel, the thought goes. The cost of the statue is often bandied about, with the Ohio Outdoor Sculpture Center citing a present-day value of over two million dollars. How could a vandal justify throwing chalk blemishes on such a treasure? I respond confidently that Spitball no longer belongs to Tony Smith, the original artist, nor does it belong to the university. 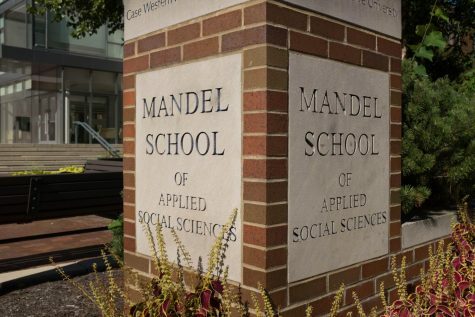 This goes beyond financial transaction; in its heart of iron Spitball belongs to the CWRU community. For decades, the CWRU community has bravely adapted Spitball to its needs, with little formal objection from the authorities. In this time, the meaning of Spitball has changed. It has become a part of the CWRU community of students, participating in day-to-day life in new ways that the artist did not intend. The CWRU administration allowed this change to occur over the decades, and I’m surprised that the student body has been so willing to relinquish its relationship with the sculpture. So few people can use a million-dollar sculpture as message board. So, I do not think the arguments of the chalk-queasy university and its partisans hold water. The only recourse available is the coldly capitalist viewpoint of the art as property. The art is owned by the university, the thinking goes, so if President Barbara Snyder so wishes it shall not be chalked. To this I say, fine. Put a police officer out by the art or build a wall around it. Show that preservation of the art is a real concern. I am not willing to allow the administration to quietly coerce the student body to stop chalking. They cannot have their cake and eat it too. I do not find any convincing reason not to chalk on Spitball. We should chalk on Spitball because it is a platform for sending positive messages of art and love to the stressed-out students on their way to Strosacker Auditorium. It is a way for the common Spartan to engage in art without fear of judgement, and the rain will wash the steel clean. Steve Kerby is a fourth-year studying astronomy and physics. He has been waiting to write this article for years.